The genus Eurotium is generally found in tropical and subtropical areas. 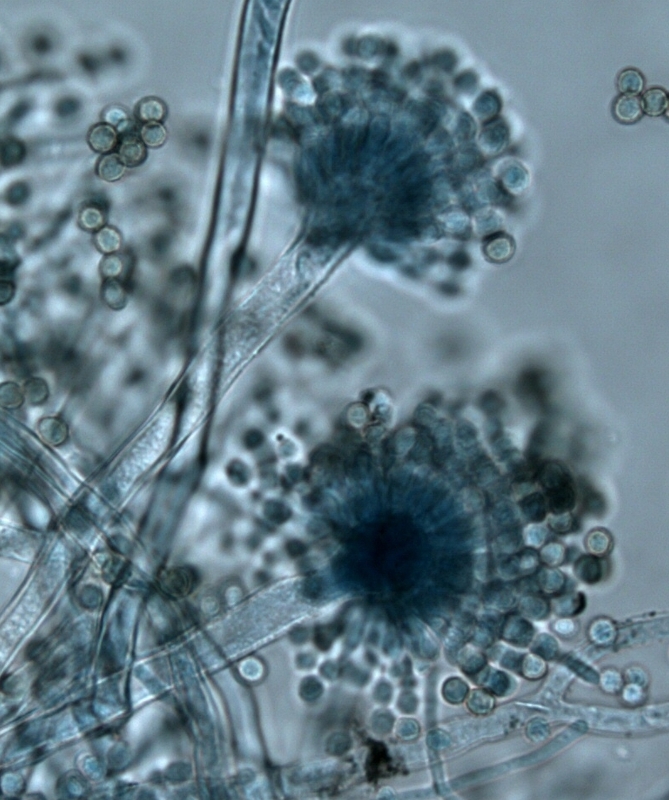 Eurotium is a xerophilic fungus that is isolated primarily from soil, plants, stored grains, and house dust. The anamorphic state is Aspergillus. Eurotium has a moderately rapid growth rate with downy to powdery colonies. Colonies are yellow, or dull to bluish green. Conidiophores are typically smooth walled and uncolored to pale brown. The conidial heads (vesicles) consist of uniseriate phialides and are radiate or loosely columnar. Conidia (spores) are in chains, spherical to ellipsoidal, and rough walled. The ascomycete state is characterized by its whitish to bright yellow spherical fruiting bodies (cleistotecia) containing spherical asci, which in turn each enclose eight colorless or pale ascospores. Ascospores may or may not have equatorial crests. Infections are rare. Only a few case of pulmonary or disseminated infection have been reported from immunocompromised patients.